Harmony FM are delighted to promote your employment and job opportunities ON-AIR and here on our website – completely FREE of charge! Please contact us with full details. 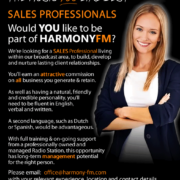 Would YOU like to be part of Harmony FM? https://harmony-fm.com/wp-content/uploads/A5-Sales-Exec-Ad-FB-280716.png 720 507 Mike https://harmony-fm.com/wp-content/uploads/HFM-New-Logo-D-Trans-201217.png Mike2016-12-19 09:28:402016-12-19 10:02:42Would YOU like to be part of Harmony FM?